English larch has striking colour variations from pinks, browns to creams depending on the section of the tree from which it is cut. There are many dark brown knots which sometimes loosen as the wood dries, this can result in resin patches that may ooze a little to begin with and sometimes during subsequent hot summers. If left untreated larch cladding will fade to a silvery grey over a period of time and as nature does it's work. English larch is very strong and a very hard-wearing wood. Due to it's super high resin content English Larch can prove to be twice as durable as common pine. English larch is highly suitable for cladding buildings in a traditional style and offers a cost effective alternative to our oak claddings. BS EN 350-2 classified English Larch, meaning that this timber is moderatley durable and can therefore be used externally without treatment if no sapwood is present. Larch sapwood is however generally accepted to be almost as hardy as the heartwood. We do not machine larch to a profiled finish, the many hard knots prevent it. 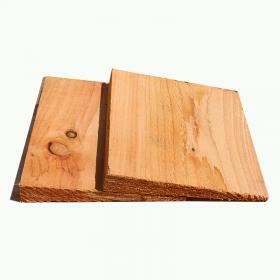 English Larch is prone to splitting when worked. This featheredge cladding is fresh sawn for use outside! For more information please do not heitate to contact our sales team on 01536 267107.